You'll be surprised at how easy it is to pull together this relaxed casual outfit. Just a multi colored geometric short sleeve blouse and dark green culottes. Bump up this ensemble with a pair of white slip-on sneakers. Marry a white crew-neck t-shirt with a pink pleated midi skirt to assemble a totaly chic ensemble. Why not introduce a pair of Vince Blair 5 Slip On Sneaker to the equation for a playful touch? For an outfit that brings function and fashion, team a white oversized sweater with white dress pants. 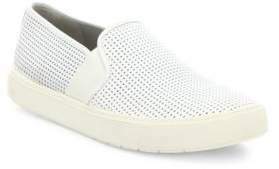 To inject a more relaxed touch into this ensemble, introduce a pair of Vince white slip-on sneakers to your outfit. If you love comfort dressing, why not take this combo of a blue ombre crew-neck t-shirt and light blue ripped boyfriend jeans for a spin? Make a bit more effort with shoes and add a pair of Vince Blair 5 Slip On Sneaker from Saks Fifth Avenue to the equation. You'll be surprised at how easy it is to pull together this casual outfit. Just a white short sleeve button down shirt and navy chinos. Dress down this outfit with a pair of white slip-on sneakers. A white cropped top and light blue ripped boyfriend jeans are essential off-duty items, without which no off-duty wardrobe would be complete. Feeling experimental? Change things up a bit by finishing off with white slip-on sneakers. If you're looking for a casual yet chic outfit, pair a light blue coat with white skinny jeans. Get a bit experimental when it comes to footwear and dial down this outfit with Vince Blair 5 Slip On Sneaker. Reach for a grey sweater dress to assemble a chic and modern-looking casual ensemble. For a more casual touch, why not complement this getup with a pair of Vince Blair 5 Slip On Sneaker? A pink bomber jacket and white skinny jeans are a pairing that every modern woman should have in her off-duty styling arsenal. Look at how great this outfit goes with a pair of Vince Blair 5 Slip On Sneaker from Saks Fifth Avenue.